O'Connell's Tower, originally uploaded by Judi FitzPatrick Studio. Our flight from Boston to Dublin first of all was overnight and then delayed by over 3 hours due to mechanical issues with the plane before it left Ireland; fortunately all of that was fixed. We left at 1:30AM, so no pics of the the flight. After pickup at Dublin airport, the bus drove us to Glasnevin Cemetery where we had breakfast/lunch in the museum's cafe, then toured the cemetery. 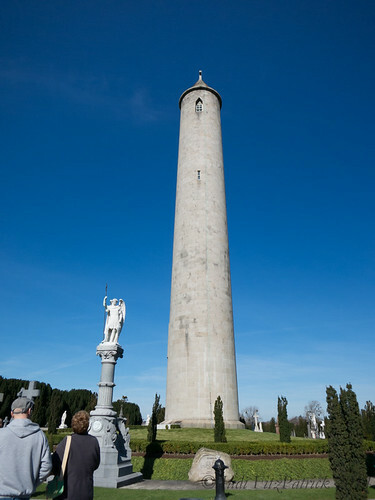 Burial place of Daniel O'Connell, this is the tower that tops his tomb. Many other famous and influential Irish people are buried in the cemetery. See my set on Flickr as it is now, and come back often to see what I've added.